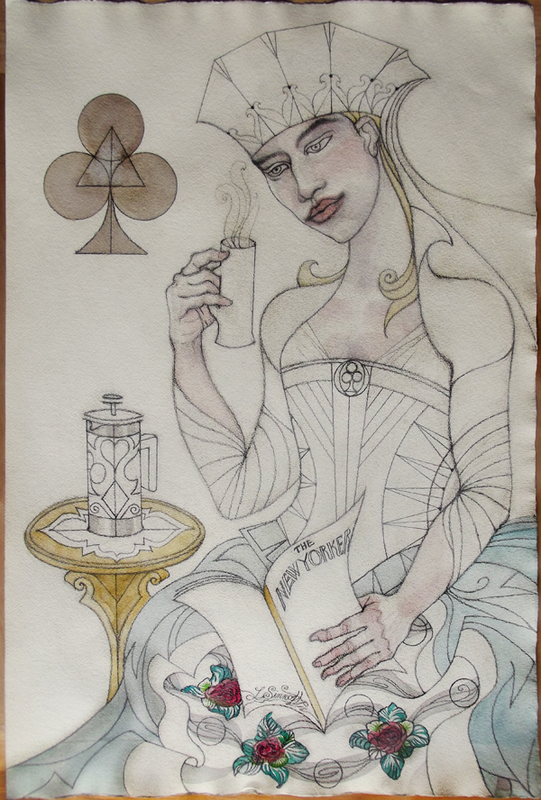 The Queen of Diamonds Paying Bills, 2011, watercolor and pencil on paper, 18" x 24"
ABOVE: The Queen of Diamonds Paying Bills, 2011 - pencil and watercolor, 20" x 26"
The Queen of Spades Watching Masterpiece Theater - pencil and watercolor, 24" x 30"
The Queen of Hearts as Mother with her Child (Version 2), watercolor and pencil on paper, 20" x 24"
Queen of Hearts as Mother with her Child (Version 1), watercolor and pencil on paper, 18" x 26"
2013 Eustice Tilley of the New Yorker as the King of Clubs - pencil and watercolor, 13" x 18" - ORIGINAL $1200. Painted for the New Yorker's Eustace Tilley Contest. Rea Irvin's refined connoisseur undoubtedly hosts a salon as scintillating as that of his image-sake, Alfred Guillaume Gabrielle, le Comte d'Orsay, who, with his beloved Lady Marguerite Blessington hosted soirees at her home in London, after the death of her husband and the separation of the count from his wife, Marguerite's step-daughter. Notably, Eustace holds court with a charming lady who is his intellectual soul-mate and is rumored to be his lover, although this is unproven. She may be seen in my Face Card Lifestyle Collection as "The Queen of Clubs Drinking Coffee and Reading the New Yorker." Eustice Tilley of the New Yorker as the King of Clubs - pencil and watercolor, 15" x 18" - ORIGINAL $1200. Painted for The New Yorker's Eustace Tilley Contest. "If he was fire, then she must be wood" - Joan of Arc, watercolor and pencil on paper, 2011, 24" x 38"
These were inspired by counting money in the ticket booth of Arena Theater. They are drawn in pencil on Redwood Credit Union note paper. Alexander Hamilton, pencil on paper, 2011, 6" x 8"
Andrew Jackson, pencil on paper, 2011, 6" x 8"
Abraham Lincoln, pencil on paper, 2011, 6" x 8"
George Washington, pencil on paper, 2011, 6" x 8"